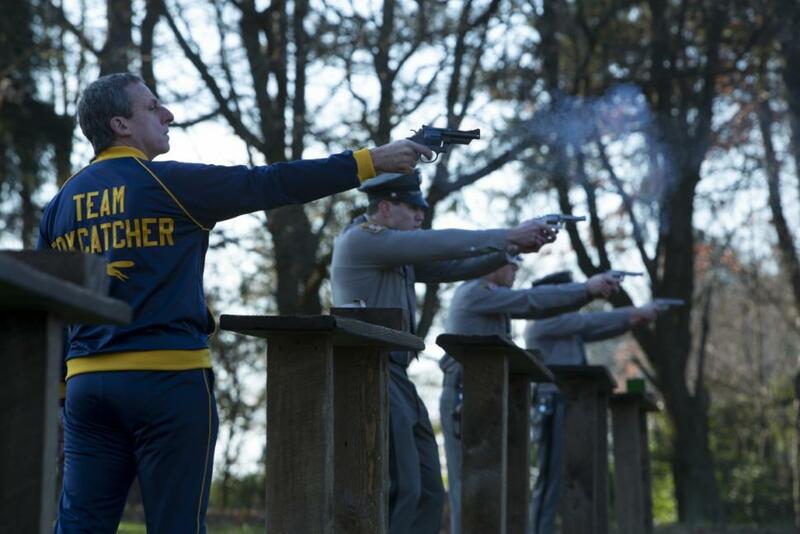 Foxcatcher (2015) – *SPOILERS* – Hooray For Movies!! The story of eccentric billionaire John Du Pont is intriguing to say the least. John Eleuthere “Golden Eagle” Du Pont to give him his full name was an American philanthropist, ornithologist, conchologist and heir to the vast Du Pont fortune. He was also an avid wrestling fan and, eventually, a convicted murderer. It is somewhat surprising then that it has taken until the last couple of years for someone to finally tell the story of his relationship with the American Olympic wrestling Shultz brothers, Mark (Channing Tatum) and Dave (Mark Ruffalo), during the 1980’s and 1990’s. Bennett Miller, he of Capote and Moneyball fame, evidently saw a story worth telling in Du Pont. A story of immense wealth, isolation, competing class systems, repressed sexuality and ultimately murder. Holed up in his oppulant Pennsylvanian mansion on the sprawling Foxcatcher Farm Estate, Du Pont decides to use his wealth and status to start a wrestling training facility at his home. Du Pont wants it to become the standard for all such facilities and eventually the training base for the US Olympic Wrestling Team. In order to fulfill his dream he handpicks the young, talented and emotionally introverted Mark Shultz to move himself and his recent Olympic medals to Foxcatcher Farm. And so begins an uneasy and unsettling patriarchal relationship between Du Pont and the younger Shultz brother, with Mark being ever further isolated from his roots and consumed by the strange world of the Du Ponts. Eventually David is convinced to relocate to Foxcatcher to join his brother, creating what Du Pont hopes will be the last piece in his dream team. Blood truly is thicker than water though and Du Pont slowly begins to feel like the little boy on the outside of the sweet shop looking in as David tries to pull his brother back from self destruction. 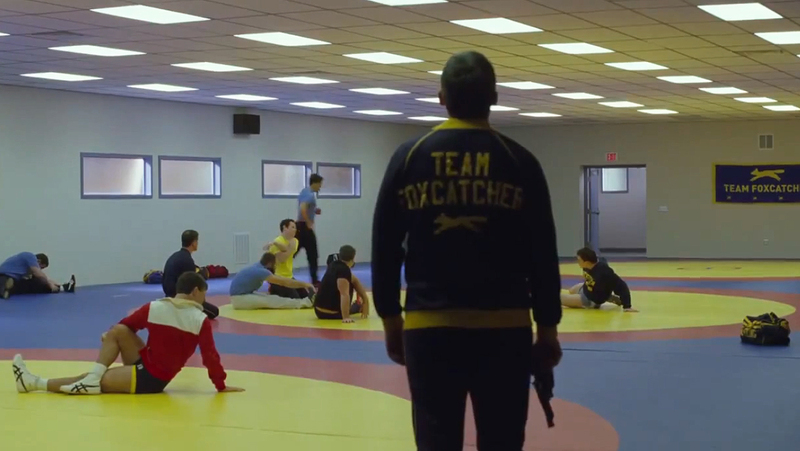 Foxcatcher from the outset is a discombobulating experience. It moves at a pace which is uniquely slow. Not quite the comatose pace of Gus Van Sant’s Last Days. More it moves at a slow waltz that seems a quarter step out of time, leaving you slightly off balance. Foxcatcher is a sports movie that is not about sports as much as it is about how alpha males communicate when they can’t use their words. The dialogue is often sparse and when faced with mounting issues that need addressing, the Shultz Brothers often resort to practicing wrestling moves on each other. It creates a balletic experience as the two muscular leads express their emotions almost exclusively through movement alone, particularly in the opening scenes when it is not clear whether the two even like each other as they spar on the practice mat, their tempo and aggression ebbing and waning. Steve Carrell as the reclusive Du Pont embodies all of the asymmetrical physical and psychological signatures that portray Du Pont as a fundamentally damaged and lonely man who craves for the approval of his cold mother (Vanessa Redgrave). A desperately lonely man, the Shutlzs’ and the circus of young male athletes they bring with them become an expensive, living playset for Du Pont. Their working class values and upbringing is something you sense Du Pont yearns for yet never truly understands. He wants to be their coach, mentor, father, brother and best friend all in one. He wants to be respected. He wants to be told he is good. When things don’t go his own way Du Pont struggles to understand his place as the outsider of the trio, unable to comprehend the love of a family member that he never experiences himself. Where as many would have made Foxcatcher as a quick paced thriller, with the climax of Du Pont’s descent into madness somewhere in the middle of the narrative, Miller’s Foxcatcher is stark in every sense. Taking a fairly staggering amount of artistic license with the timeline (here the relationships play out over a short number of years whereas in reality it was a decade or so) the majority of the action is set against grey and cold landscapes, or the emotionally barren Du Pont home. The performances are built on minimalism, all slumped shoulders and awkward movements of Mark and David Shultz and the jarring cadence of Du Pont’s egotistical diatribes. With Carrell particularly, it is on face value as far from the normally extrovert comedic performances that have made him an A list movie star. However Carrell uses his natural talent for portraying comedy and tragedy through his eyes and body language to great effect, making Du Pont an unsettling but empathetic antagonist. While all of the above may make Foxcatcher an intriguing experience for some, it is not an enjoyable or entertaining one. The pace is jarring, and because much of the emotional heart of the film is in what isn’t said it can give the impression that not much is happening. I saw it in a screening with around 60 people and the sense of boredom and frustration of those around me was palpable. I love slow and difficult movies but seeing Foxcatcher with a mass audience highlighted two things that had I seen it at home wouldn’t have been apparent; firstly that the energy of the audience in a screening probably is more affecting than I previously realised; and secondly that many will have seen the trailers and cast for Foxcatcher, both of which are ultimately misleading in terms of the end result, and thought they were getting a very different movie. I came out certain it was a difficult experience but uncertain whether I liked it. It took a few days of thinking about Foxcatcher to realise something profound. I was still thinking about it. If nothing else it had stayed with me and I had a strange yearning to see it again. Whether that means I liked it or not I don’t know but any film that stays with me like that deserves credit. A very disturbing movie. But also home to some of the best performances of the past year. Good review.